On Table or the trestles beneath Plate? What women or gods made these? Your process bold? What mad pursuit? What struggle to a taste? Made this yummy sugar-free red velvet cake. With my sincere apologies to Keats. Recipe by Flutter. Leaves by Hollis. flutter leaves her gifts wherever she goes, doesn't she. i love that girl. Red Velvet cake looks yummy. That is all you know, and all you need to know. And I think yours came out well. Sugar free! Wow. Truly lovely. And Bub & Pie finished it up nicely! Thanks! That looks pretty good to me! Red velvet is one of my favorite types of cake. Oh I couldn't be more proud!!! Nice work on the leaves, Hollis! Did you like the frosting? I'm not sure what has impressed me most! 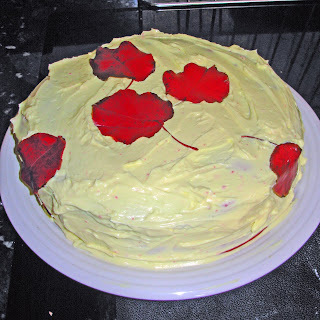 Your awesome ode (LOL), the cake, Hollis' leaves, or flutter's recipe! Looks delish! Happy Turkey Day. Don't forget to watch Numb3rs tonight. Your boyfriend Wil is guest starring! Wow - divine! And sugar free? Really? I really ought to try this, sugar free or otherwise, with a name like that it would seem impossible not to be good. And Flutter, well she does sprinkle everything with a special kind of magic.